Gmail is an amazingly powerful email service on its own, but if you could make it faster and better, wouldn’t you? I know I would. It’s sad to know that an average employee spends an astonishing 20 percent of their time managing emails. But the good thing is that it’s not that difficult to bring this down, significantly. In this article, we will list 18 Google Chrome extensions for Gmail that will take your efficiency through the roof. Even for simple things like sharing information with a teammate or delegating a task, you will have to rely on CC, BCC, and Forwards. It will be hard to differentiate between internal and external communication. Hiver can help you solve all of these problems and significantly. With this extension, you will be able to access any number of shared email accounts such as marketing@, help@, right from your own inbox – no more switching accounts! On top of that, you will be able to assign tasks to teammates and track their status. And that’s not all, with Hiver, you get Email Notes which are like chat messages that appear right beside your email thread. This way teams can stop using email to communicate among themselves. No CCs, no BCCs, and no forwarding. Say you’re managing sales from Gmail, Notes can used to exchange prospect information, offer tips, or collaborate on any roadblocks without having to write a single email. You can choose whom to notify using @mentions. Moreover, these notes stay with the email thread forever. Every time you see a new email come in, you get a bit distracted. You get an urge to open it and see what’s it about. Therein lies the problem. It might be completely unrelated to what you were doing at that moment, and, it takes away your focus. Inbox When Ready is your way out of this. It helps protect your focus by completely hiding your inbox by default. You won’t be able to see any emails unless you deliberately choose to. You will still be able to see starred emails or emails under a label, search your email archives and send new emails. This way you will be able to process and send emails in a distraction-free environment. It lets you define an inbox lockout schedule so you can process emails when you are ready. The free edition of Inbox When Ready adds a small message to your email signature. To remove it, you can upgrade to Inbox When Ready Pro, which is priced at $4/month paid annually. You can download Inbox When Ready for Gmail here. Have you ever gotten really pissed off trying to locate an attachment? I’m sure most of us have. It’s one of those things that slow you down even on the brightest of days. Enter Dittach. This Chrome extension lets you organize and sort all the attachments you have ever sent or received. It makes your life easier by letting you filter the files based on their type – photos, slideshows, PDFs, videos, music, and so on. Despite the heavy lifting it does for you, it is absolutely easy to use. You can download Dittach here. Gmail in its default form doesn’t let you reply to multiple emails at once. That’s where this extension comes in. It makes it possible to reply to all the selected emails in one go. It is very easy to use. All you have to do is select the emails you want to reply, and click ‘Reply’. You can download Batch Reply for Gmail here. Truth be told, a lot of us are so addicted to email to that we always have Gmail open in a tab or window. The itch to check your inbox is not easy to resist. A simple glance often ends up eating away hours. You can avoid this to a large extent by installing Checker Plus for Gmail. It enables people to read, or delete emails without opening Gmail. If you get an email while you’re busy, this extension can optionally read it out loud. Moreover, it lets you manage multiple accounts and also supports offline view. It comes with a Do Not Disturb feature and also another option to run in the background even when Chrome is closed. It is free, but a donation of any amount will get you additional features. You can download Checker Plus for Gmail here. According to a Canadian survey, people spend a total of 17 hours a week reading, responding and sending work emails both at work and at home. One way to cut this down is to write emails faster. That’s where Gorgias comes in. This extension increases your productivity by letting you create templates and keyboard shortcuts. You can define custom keyboard shortcuts for certain long sentences or phrases you use frequently. It will automatically expand and replaces that text as you type. For instance, you can define a shortcut like hvg for ‘Hiver lets you collaborate on shared inboxes right from Gmail’. All you have to do is type hvg and press the tab key, the full sentence will appear automatically. You can also create email templates that can be inserted from the compose window. This is a great way to save time that would otherwise be wasted in writing repetitive emails. Not having to memorize every keyboard shortcut as it lets you search from inside the Compose box. You can download Gorgias here. An average office worker sends 40 emails per day. Every time you send an email without an attractive signature, you are losing a branding opportunity. 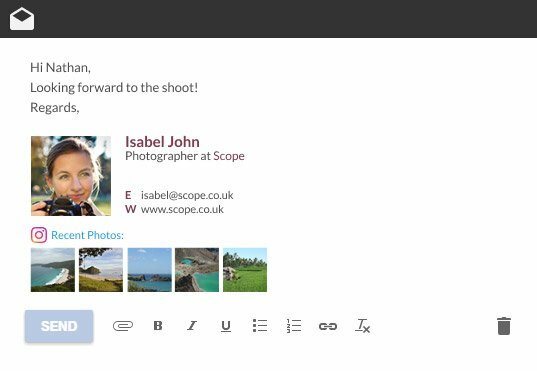 The WiseStamp extension helps you create rich email signatures. It also lets you add links to your social media accounts, websites, the items you sell or even your latest blog posts. Every email that you reply becomes a vehicle of promotion. If you tend to send a lot of emails, it is a great way to increase the reach of your blog posts. On top of that, it gives your email a personal touch and lends you credibility. This can improve the likelihood of getting replies. You can integrate it to your Google Analytics to learn how well your campaigns are performing. You can download Wisestamp here. Sending emails at the right time significantly improves the chances of getting a reply. But Gmail doesn’t have a schedule email option. That’s where Boomerang comes in. This extension lets people schedule emails to be sent at a later time. Boomerang also lets you snooze incoming emails and have them come back to your inbox at a later time. It helps you keep your Inbox clean, without losing track of important messages. The Inbox Pause feature. It helps you get focused by temporarily delaying the arrival of messages to your Inbox. You can download Boomerang here. People use Gmail for a lot more than exchanging email – from filing your bills to collaborating on documents. What if you can automate all of this? That’s exactly Zapier does. It connects Gmail to the other apps you use like Google Sheets, Facebook Lead Ads, and Typeform to automate the tedious tasks in your workflow. It is very easy to set-up. 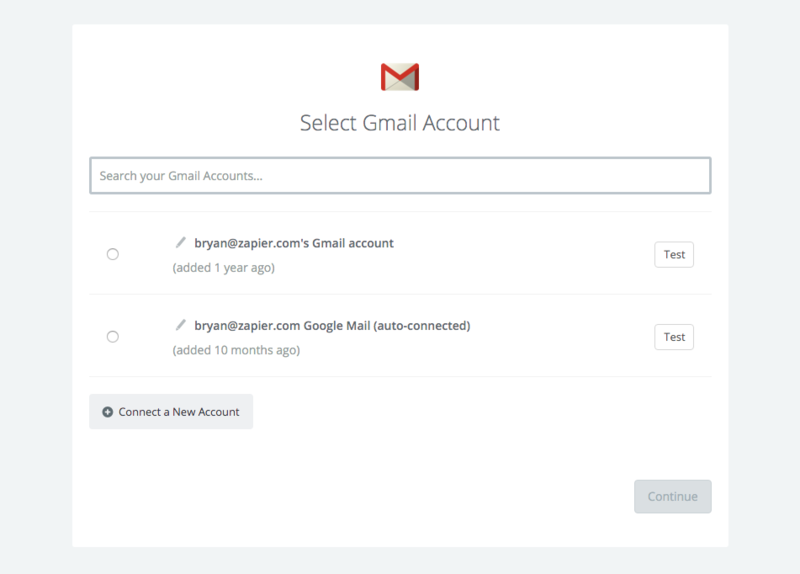 All you have to do is connect Gmail to Zapier and set up the workflows. After that, you can start the automated workflows with just 2 clicks. Save Gmail attachments to Google Drive. Save Gmail emails matching certain traits to a Google Spreadsheet. Send an email via Gmail for updated spreadsheets. Create Trello cards from new Gmail emails. Get new Gmail emails in Slack. Save Gmail attachments to Dropbox in the original file format. There are more than 100 workflows you can automate. Zapier has a free version to automate personal tasks. There are two versions for business users – For Work priced at $20/month and For Teams priced at $250/month. 14-day free trials are available for both the plans. You can download Zapier here. These days people have very little tolerance towards boring and generic emails. You can’t expect anyone to read your emails unless they are personalized. You can fix this problem to a large extent with the Crystal Chrome extension. It goes through public data and text, and generates personality reports for your contacts. You can personalize your communication style according to the recipient’s personality. It will give you personality insights on LinkedIn profiles too. Every email you send, you are representing your organization or your team. A grammatically incorrect message damages your reputation massively. Even minor typos will make you look bad. Grammarly can stop this from happening to a large extent. Every time you write an email, this extension will check the text for grammar and spelling errors, highlight them, and suggests improvements. Apart from just typos, it also takes care of subject-verb agreement, article use, modifier placement, misused homophones and more. This extension works almost everywhere on the web, including Facebook, Twitter, Evernote, and so on. It has a free personal plan with basic features. The premium plan is priced at $29.95/ month. You can download Grammarly here. The success of most email campaigns depends on how well you optimize the open, read, and response rates. That’s why the importance of automation and tracking cannot be overstated. Yesware does both, and at scale. It lets you set-up multi-stage personalized email campaigns, track their engagement, and generate detailed reports. With Yesware, you can track – email opens, link clicks, where or when or on what device your email was opened, and how much time each recipient is spending on attachments. Yesware’s email tracking feature – it works in real-time. You can download Yesware here. I’m sure you would have faced situations where you wanted to manage your Gmail inbox offline. Typically, an email client would have been the answer. Now, you can do the same from your browser itself. All you have to do is install the Gmail Offline extension. It lets you read, reply, search, and archive emails without internet. All the emails will sync to your Chrome browser the first time you run the extension. Every action you do after that will be queued up and completed when the internet is available. The interface is extremely responsive and easy-to-use. You can get used to it quickly. You can download Gmail Offline here. Organizations now are more vulnerable than ever to cybersecurity threats. Every time you share a sensitive document, there is a likelihood of it spreading online or people misusing it. And that’s where Digify comes in. This Chrome extension alerts you when your Gmail attachments have been read. You can track – who has seen them, for how long, from where, how many times, and if your documents are being forwarded or re-shared. Make the attachments accessible only to a select few or to everyone. Allow or restrict recipients from forwarding your files to someone else. Revoke access to an attachment. Permit recipients to print or download an attachment. Add another layer of security by setting your own password or passkey for a document. The attachments can be set to self-destruct upon expiry of a preset time or after it has been viewed by the recipient. There is a 7-day free trial available. The team plan comes at $120/month ($90/month when billed annually). You can download Digify here. The success of your outbound email campaigns heavily depends on finding email addresses — an exercise that is famously frustrating. Clearbit Connect does its bit to change that. It lets you find the email addresses of the right individuals in minutes. All you have to do is search for the company and you get an exhaustive list consisting of the individual's designation, location, website, job titles, and social profiles. It gives you the sender coordinates of every email you receive. The free edition lets you do 100 lookups per month. You can download Clearbit Connect here. Video in email has never really worked. People have always been apprehensive about playback issues, the clutter it causes, and of course, the inability to track what happens after you send them. With BombBomb, you can record and send video email in Gmail. This will help you build trust and familiarity, and communicate with more clarity. Moreover, this approach saves time as it is easier to speak than type. You can add any video from your BombBomb library into an email. A free trial is available for 14 days. The paid plans start at $468/year. You can download BombBomb here. An average office worker receives 121 emails per day. A major chunk of this will be unwanted newsletters, social media updates, promotional emails, emails from strangers, or spam. We spend hours daily trying to cope with this never-ending barrage. The Block Sender extension is your answer. It makes your life easier by giving you a choice to block any incoming email in one click. Every time you block someone, they will get a fake error message. The blocked messages can be sent to trash, permanently deleted, or made to skip the inbox and be archived. You can download Block Sender here. Sharing large files in Gmail is a headache. The size limit for attachments is only 25 MB, so we end up relying on Google Drive or other cloud storage services. And that involves even more steps. With the Send Anywhere extension installed, the entire process becomes way smoother. Large files up to the size of 50 GB can be attached straight from your Gmail compose window. It appears in the form of a clickable link in the email. The recipient can download the files by clicking on the same. These links will be valid for 48 hours for the free plan users. While the premium users have the choice of setting an expiration date of their liking. Either way, the files will get deleted from the server upon their expiry. The recipient can download the files from any device they want to. There is a free edition that comes with limited functionalities. The Plus plan priced at $5.99 / month. You can download Send Anywhere here. These extensions can dramatically reduce the time you spent in your inbox. But, make sure you install only what's necessary. Adding too many extensions can take a toll on your computer's performance. If you feel you can't live without certain extensions, use Switcher to quickly enable and disable extensions so that the browser performance is not affected. A parting note – no matter what add-on you install, always make sure they are secure.